I know very few people who don’t love a good waffle. I love the classic, but, you know me: traditional is rarely good enough for the starving artist. I am obsessed with gingerbread, so I had the idea to combine it with my waffle batter – quite the good idea if I do say so myself. And my guest Tim, who had his birthday yesterday, heartily agreed that it made for a fantastic birthday breakfast. This one is easy to pull off for me since I always have baking basics (flour, sugar, powder, soda, butter) in my kitchen, not to mention all the spices. All I need to buy is buttermilk and eggs and I have breakfast for three (or as many as five). I also had some sausage leftover from my Impromptu Comfort Food recipe I posted a few days ago, so I just fried those up in a skillet and added some maple syrup in at the end for a quick and easy breakfast sausage. So delicious – a must-try. 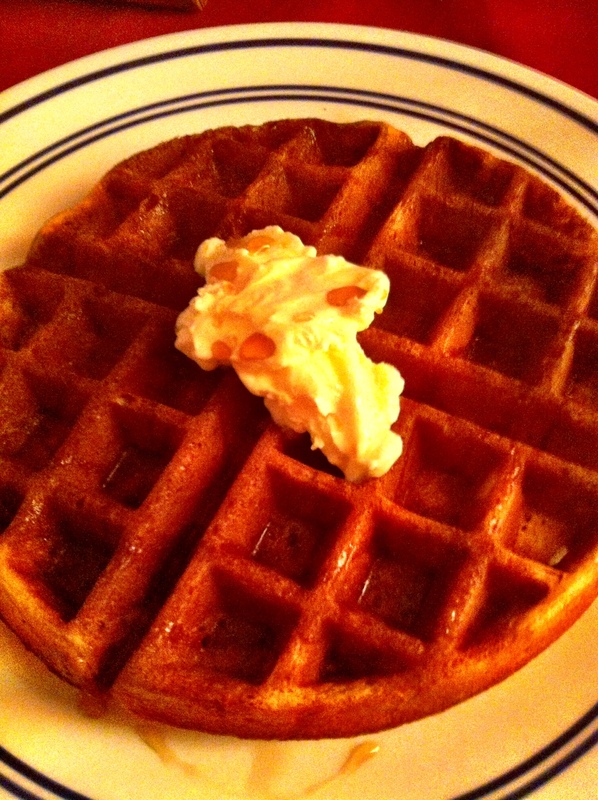 Now I have to tell you that this batch of waffles has a special ingredient: Trader Joe’s Speculoos Cookie Butter. My roommate bought a jar for her parents. 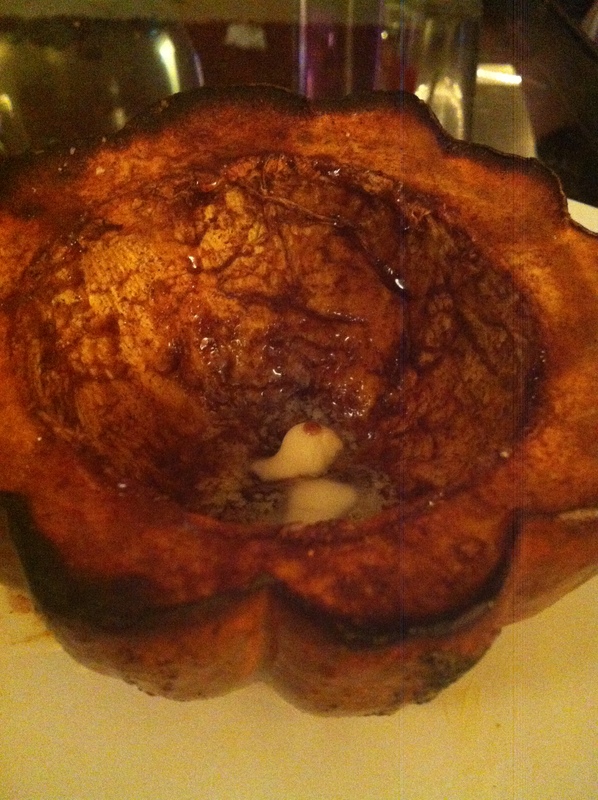 I saw it sitting on the table while I was assembling the waffle batter and thought… yeah, this needs to happen. 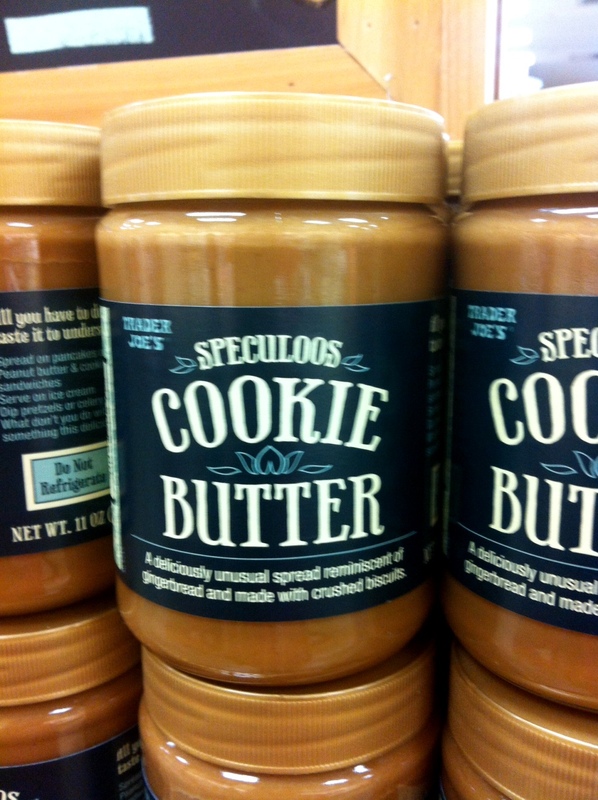 If you haven’t tried cookie butter yet, run, don’t walk, to your nearest Trader Joe’s and pick some up. It’s the most divine combination of gingerbread and cookie, melded into this spread that still has a light crunch to it. I warn you it is VERY dangerous stuff – I have mindlessly housed half a jar on more than one occasion. At 90 calories per tablespoon, it is no small indulgence. Yikes. You will likely be getting many more recipes that employ this heavenly concoction. For this one, not only can you put it in the batter, but if you’re feeling exceptionally decadent, you can even put it on top. Gasp! Personally, I stick to the tradition whipped butter and syrup. If you read my post “Griddled Amazingness“, you’ll know all about my feelings on both of those toppings. What’s that? You thought waffles were too involved for the starving artist? Oh sweetie, just you wait – I do it all. Whether I’m whipping together waffles for friends or baking a decadent treat for a party, I’m always looking for the same traits: simple, resourceful, affordable (mostly), and a little out of the ordinary. And honestly, the joy and warmth that comes with serving fresh hot waffles (or any warm baked good) to your loved ones is always worth it, regardless of price. I am going to continue the breakfast theme for the rest of the week, so check back in to see what I get up to. What do you put in your waffles? I have two shocking revelations for you about popcorn. Seriously, stop buying bags of microwaveable popcorn. Wherever you can find microwave popcorn, you can buy bags of popping corn. Shockingly, I get mine at Trader Joe’s – $3.99 for a bag that will last for ages. 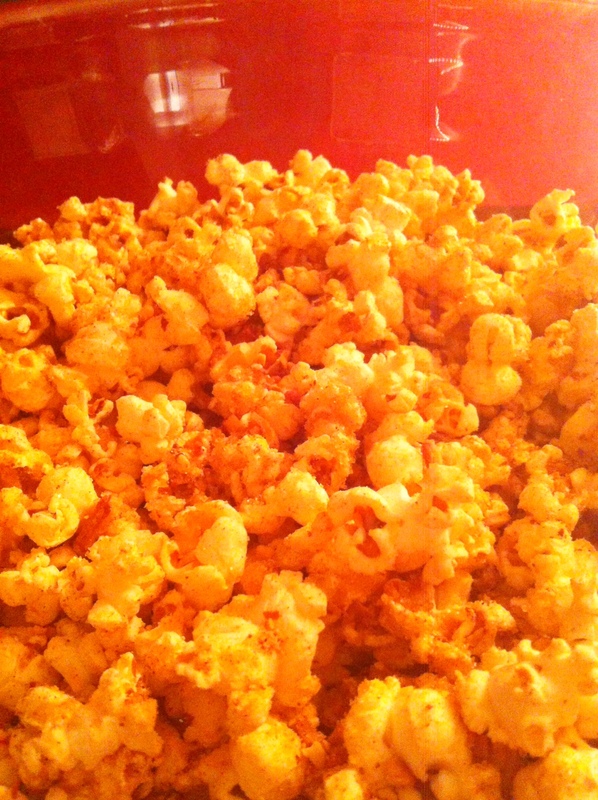 Just 1/2 cup of kernels will pop enough corn to fill a giant bowl to serve at your party. To pop, all you need is a small lidded stockpot and a little bit of oil. And you know what? It is super fun. You get the kernels in the hot oil, put the lid on, and shake it continuously until the pot is filled with corn. I’m telling you, try it once and you’ll never go back. The best part is it leaves you a canvas on which to unleash your culinary artwork… by which I mean you can dress it with whatever you want. The most important tip I can give about popping your own corn is that no matter what you plan to do with your corn (savory or sweet), the first thing you do when you’re done popping is add salt. I love Kosher salt, in fact it’s the only salt I use to cook, BUT it is not the best salt for popcorn. Too coarse. What you need is regular old table salt. I believe they may actually sell popcorn salt, but the starving artist says don’t waste your money. If all you have is coarse salt, just throw some in your food processor and pulse until it’s fine. One of my favorite things to do with popcorn is make it sweet. 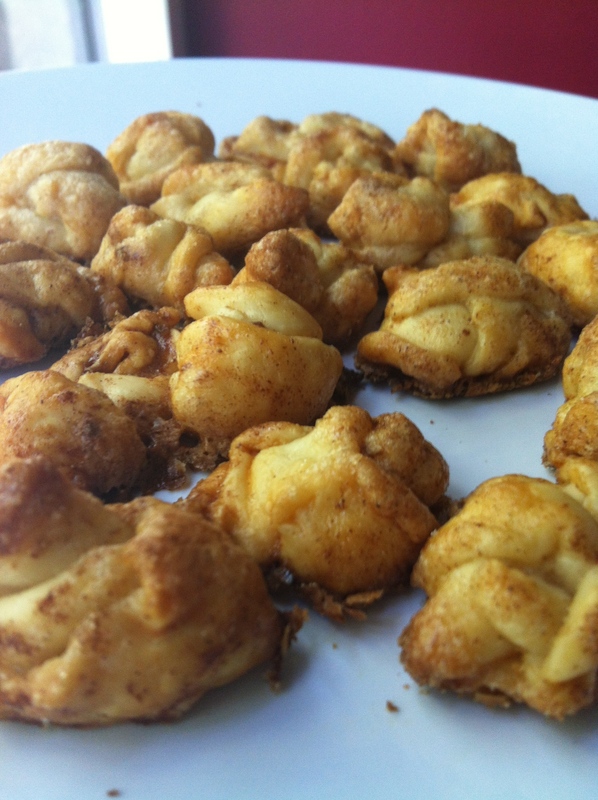 I toss it with salt, butter, and a mixture of sugar, cinnamon, and ginger. It’s totally addicting. I served this at my friend’s halloween party and I had to make a second batch because everyone mowed through the first bowl. People will freak out. Like with the salt, you want to make sure your sugar is a fine ground. Some organic sugars (like what they sell at Trader Joe’s) is more coarse than regular sugar. If that’s the case, do the same thing with the salt – throw it in your processor and pulse until fine. Anyone have any fun unique ways to use and/or dress up popcorn?